Pictured left to right: Bill Barrett, senior rail and truck strategy and operations manager, Toyota Logistics Services; Lee Hobgood, general manager of vehicle transportation, Toyota Logistics Services; Aaron Lakey, director, BNSF Automotive Sales; Dave Fleenor, assistant vice president, BNSF Automotive; and D'Anne Duclos, vice president, Toyota Logistics Services. FORT WORTH, Texas, April 19, 2018 – BNSF Railway Company (BNSF) was recently named the 2017 recipient of the President’s Award for Rail Logistics Excellence by Toyota Logistics Services for the fourth year in a row. 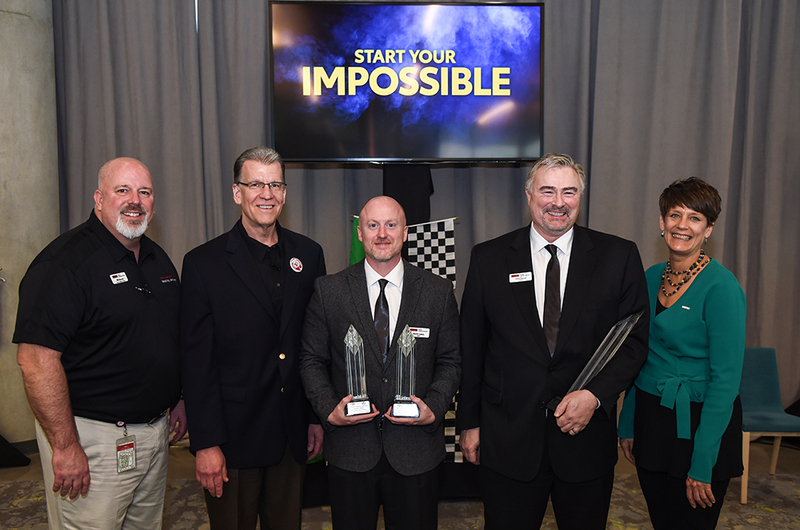 The President’s Award is Toyota’s highest supplier honor given to service partners who demonstrate combined excellence in quality, customer service, kaizen, and on-time performance. BNSF also received Toyota Logistics Services’ Logistics Excellence Awards for kaizen (continuous improvement) and for customer service. In 2017, BNSF handled more than 530,000 Toyota and Lexus vehicles throughout the United States and Canada.